même bête started as a small side project to make some extra money to pay off some debts, for St.Lucian Taribba Hinkson who now lives in Ethiopia, Africa. At the time, Taribba felt that her creative juices were not flowing and needed an outlet to express herself. 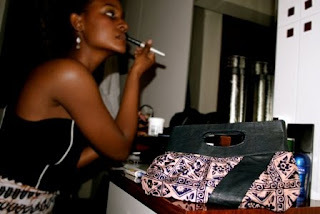 même bête began in 2009 in Addis Ababa, Ethiopia with humble beginnings. The idea was to create East meets West bag, by combining the best of Ethiopian leather with the most energetic traditional 100% cotton, African Dutch wax cloth. The leather used is mostly sheep and goat skin. Generally, sheep skin leather is softer and smoother and more expensive. Cow and ox hide is a thicker tougher and does not wear well with cotton. These practical bags, masked behind their chic design and can go anywhere are truly unique because of the leather/wax and cotton combinations. The leather and fabric colour and shading variations are natural and are not flaws, considered part of the unique beauty of each bag. Also very few of the same bags are made to maintain their uniqueness. The name même bête comes from a St. Lucian Creole saying that roughly translates to "we are all the same." The name also creates a loose pun on the various types of leather used; ox, sheep, goat and cow. 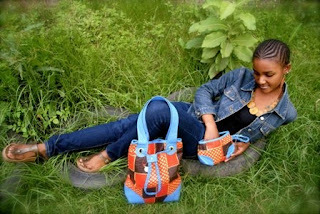 To order a même bête bag or become a Facebook Fan: même bête - Bag prices range from roughly $25 USD to $60 USD, depending on the style and type of leather used. Visit même bête and fill out a form on the contact us page. Choose one of the designs or to custom order from the available cotton and leather. Here is your chance to win a même bête clutch. The winner will get an email of the clutch styles in stock, from Taribba. This lucky person will get to choose their clutch. This is open to everybody, no matter the country. Email TheSweet7@gmail.com with the subject "même bête." Include your name, mailing address, email address and telephone contact in the email. Incomplete entries will be disqualified. One entry per person. Winners will be selected randomly by random.org. The winner will be notified by email and announced on the blog. This Sweet 7 Giveaway ends on Wednesday, 26th May @ 7PM!